BlogrCart Closet v2 makes it easy to setup an image slider without ever to code or look at any HTML markups. Using Blogger Image widgets, Blogger store users can upload several slider images, write custom captions & create click to action links so easily. 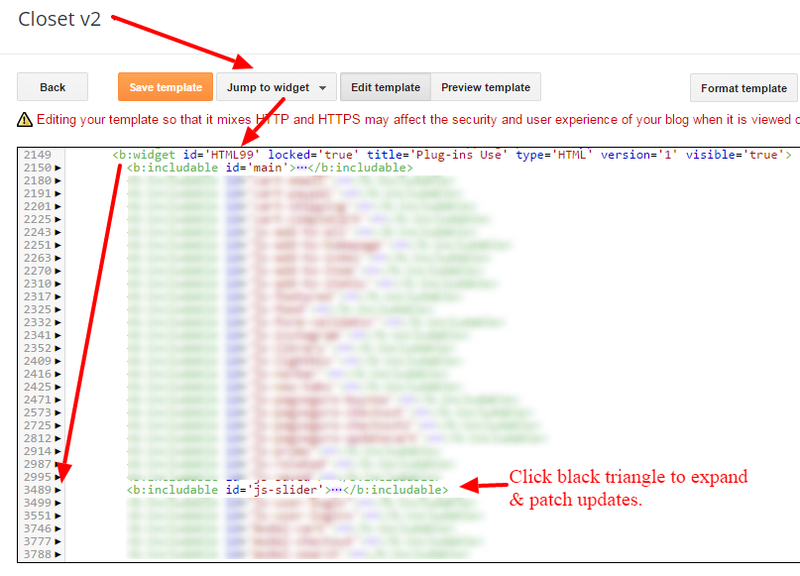 Customizing the template looks, colors & background colors can also be done using Blogger Template Designer functions. Update/Patch for BlogrCart Closet v2 Image Slider Functions. With the recent March/April 2016 Blogger updates, BlogrCart Closet v2 Blogger store template with shopping cart has a minor update for this particular functionality. Below are the step by step easy guide to update this freemium theme version. Go to Template > (Backup your template if required) > click Edit HTML > click the Jump to widget tab > select HTML99 . At HTML99 expand <b:includable id='js-slider'> to view the Image slider functions. Click Save Template and Preview your homepage image slider. What Was This Update/Patch For? Updates to recent Blogger template widgets behavior.